Since having my daughter last year, I’m now truly appreciating just how baby- and kid-friendly Stockholm is. 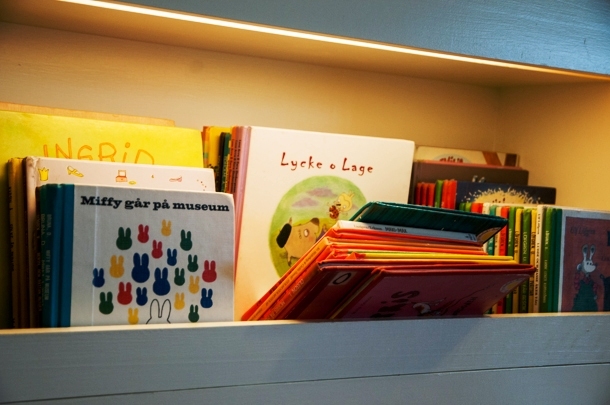 From allowing parents pushing strollers to ride for free on public buses to lots of free activities and workshops, kid libraries, and museums like Junibacken dedicated to your little tot. 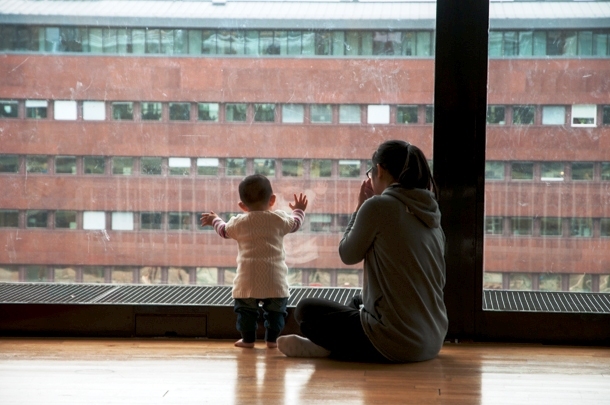 One such resource is Rum för Barn (Room for kids) located on the fourth floor of Stockholm’s iconic Kulturhuset. 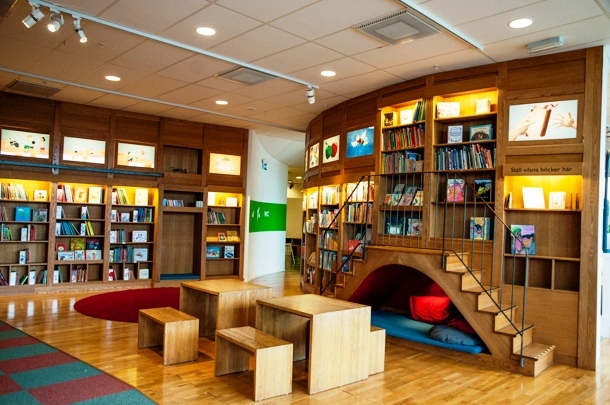 This exquisite children’s library allows you to read and borrow books in Swedish, Arabic, English, Finnish, French, German, Russian, and Spanish, as well as let your kid try their hands at painting and sculpting, listen to stories and fairy tales, participate in sing-alongs, and other daily activities organized by staff. With roughly 250,000 visitors each year, Rum för Barn is Kulturhuset’s most visited attraction. Because of its popularity and depending on the time of day, you might run into queues to get in. A red sign means there are lot of people vying for a spot so it may be best to come back later. A yellow sign signifies a shorter waiting time, while a green sign means you’re welcome in. Strollers must be parked on the “Plattan” floor where you’ll see a rather cute section with a “Stroller Parking” sign and rows of parked baby wagons. As in many Swedish homes, shoes must be taken off before entering so make sure you’ve got socks on. 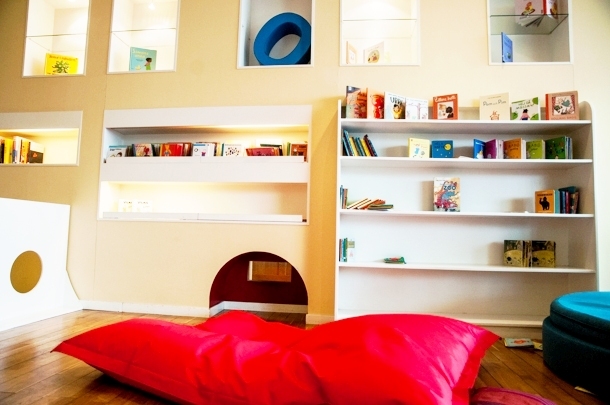 There are three sectioned libraries for children of different age groups – from stumbling toddlers to bumbling preteens – and the rooms have nooks, crannies, and hideaways for kids to play in as well as hammocks, bean bags, and shelves of vibrant children’s books to read and thumb through. The focus is on cognitive development, motor skills, and other creativity boosters so you’ll be hard pressed to find computer games or computerized electronics here. 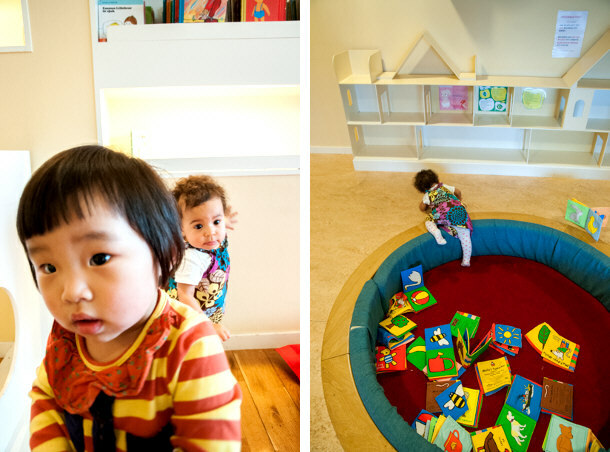 The Yellow Room is for toddlers between 0-3 years and it has books, play areas, a play pen, and toddler-friendly toys. Within seconds of stepping into the Yellow Room, my daughter was already pulling books off shelves, attempting to rip them to shreds as toddlers do, and failing miserably. More so, she was able to run (rather, roll) around with glee, make friends with other tots, converse in their cryptic toddler language, and have boundless fun. 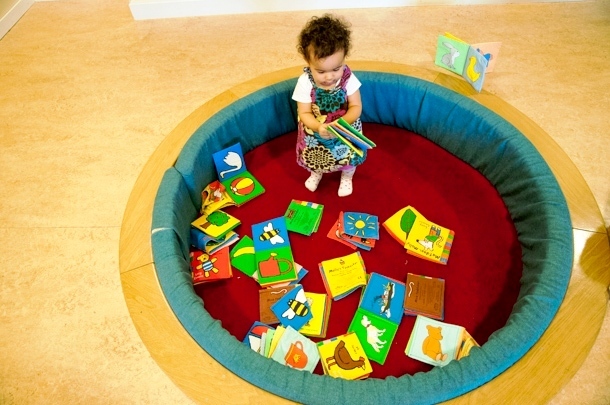 It’s looking like weekly trips to the Yellow Room will now be added to our schedule alongside her baby swimming classes. The Brown Room with its oak wood finishes is geared towards kids between the ages of 4-7 with more educational books such as books covering the human body and the universe, factual books about transportation, animals, and nature as well as miniature worlds and picture books. The third section, the White Room, has fiction novels, magazines, and comic books as well as maps and encyclopedias geared towards children aged 8-12. 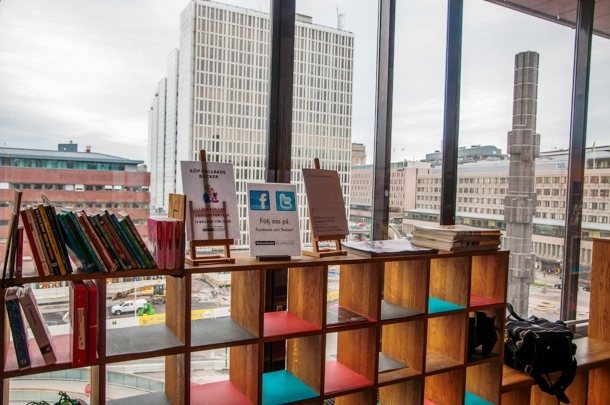 With a free Stockholm Public Library card, you can borrow books for free. All activities are complimentary for the most part, except its Art Studio which costs a modest 30 SEK per session for materials used – paint, brushes, paper, canvases, and more. The Art Studio allows kids to test out their painting and sculpting skills under the supervision of in-house artists. There’s a section for feeding your baby as well as baby-changing facilities. Rum för Barn is open daily. Visit their website for opening hours.